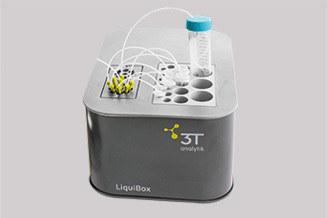 The LiquiBox Compact is an auto-sampling device handling up to 8 samples per channel. The LiquiBox Compact gives you the outstanding opportunity to upgrade your existing qCell T series to qCell T auto with all its features and software implementation except for the sample incubation function. The patented special design quartz chip ensures easy handling, high reliability and sensitivity with stress-free conditions on the quartz crystal. 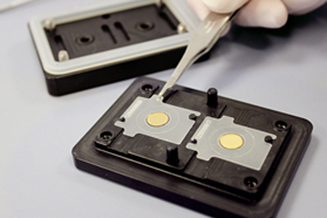 Each quartz sensor comes mounted on a thin polymer sensor sheet of precise dimensions. 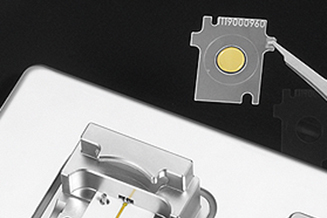 The sensor chip is labeled with a unique serial number and features an asymmetric shape with grooves which precisely fits into a flat cavity at the bottom of the open-architecture flow cell. Different quartz coatings, from basic elements ( Ti, Ag, Cu, Pt, etc. ), Oxides (SiO2, Al2O3, etc. ), Hydroxyapatite, stainless steel to Polymers are available upon request. If you have special sensor requirements, simply fill in our webform or contact us.